﻿World Water Day: Calendar, History, Tweets, Facts, Quotes & Activities. World Water Day serves to raise awareness about water issues such as sanitation problems and water shortages in many parts of the world. Today, 1 in 10 people lack access to safe and clean water, a problem which has a direct impact on the economy, health of the population and well-being of women and children worldwide. In 1992, World Water Day was proposed at the United Nations Conference on Environment and Development. 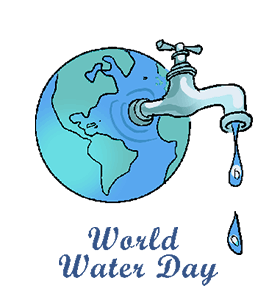 The United Nations General Assembly responded to the proposition in 1993 by declaring March 22 as World Water Day. Each year, the UN-Water agency allocates a theme corresponding to a current or potential challenge for World Water Day. The theme for World Water Day 2018 was Nature for Water. In developing nations, nearly 80% of illnesses can be linked to poor water and sanitation conditions. Russia's Lake Baikal and North America's Great Lakes hold about 40% of the world's fresh water supply, the large remainder of the freshwater supply is in the form of icecaps and glaciers. According to UNICEF, diarrhea is the second leading cause of death among children under the age of 5 in the world. Don't waste water!!! Make a conscious effort to use less water on World Water Day and on other days. Some ways to reduce water consumption include, showers instead of baths, washing full loads of clothing only and turning off the tap while washing dishes and brushing teeth. Donate to a charity or organization that supports water issues in developing nations. WaterAid is an organization that works in poor countries to set up and maintain water sources, UNICEF and UNCHR also provide support and relief efforts to improve water sanitation and hygiene globally. Volunteer to help clean up trash and other debris along a beach or shore. This garbage and debris pollutes the water that we need in our daily lives. Watch documentaries about water-related issues such as pollution, contamination and diseases. Our top picks are Troubled Water , The Fight for Water , Flow for the Love of Water , Tapped , Thirst and Dhaka's Cholera Wars . Take part in a local World Water Day celebration, such as a film screening or a water conservation event. One of the largest events, the White House Water Summit in Washington DC, will be livestreamed.